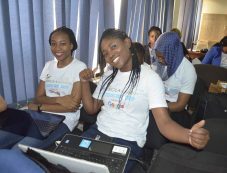 The Visiola Foundation (Nigeria) equips girls with skills in science, technology, engineering and mathematics (STEM), and empowers them to use those skills to develop solutions in their communities. By doing so, Visiola supports the emergence of a new cadre of African leaders who will spur the continent’s socio-economic transformation. U.S. donors can now support its efforts through a contribution to the American Friends of the Visiola Foundation.